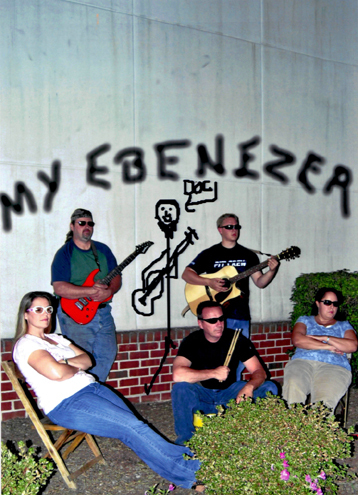 My Ebenezer was brought together to proclaim the name of Jesus through music and song. The band has performed at amusement parks, festivals, church and worship services ranging from upstate Pa. down to the southern states. The band was formed when Bill, the drummer, had a vision in which he was given the members and the mission. Bill grew up in the Trooper area and has played drums in various rock bands in the area. Phil, electric guitarist, grew up in the Pottstown area and has played the six-strings for most of his life. He plays lead and writes the majority of the songs. Floyd is a Doctor of Music and plays the bass with a flair derived from his roots in the deep south. He writes some of the songs and records the group’s music. Multi-instrumentalist Jeff plays rhythm guitar, keyboards, violin, bass, and any other instrument he can get his hands on. He is our chief musician and assists in writing the majority of the music. And last, but not least, the group’s two front women; Kristy & Christie. Kristy is a Navy brat who was raised throughout the world. She has sung in front of crowds since she was young. Christie was raised in the Douglassville area and she too has sung since she was young, and additionally plays keys on select songs. Both girls sing all the songs and assist in writing music and lyrics. This group is proof that music with a positive message can be contemporary and cutting edge. If you like what you hear, you can see them every Sunday morning at Grace Assembly of God, Bridge St., Spring City. Together, they have brought church service to the 21st century with a fresh face. “It’s not your grandma’s church service anymore,” they proclaim.